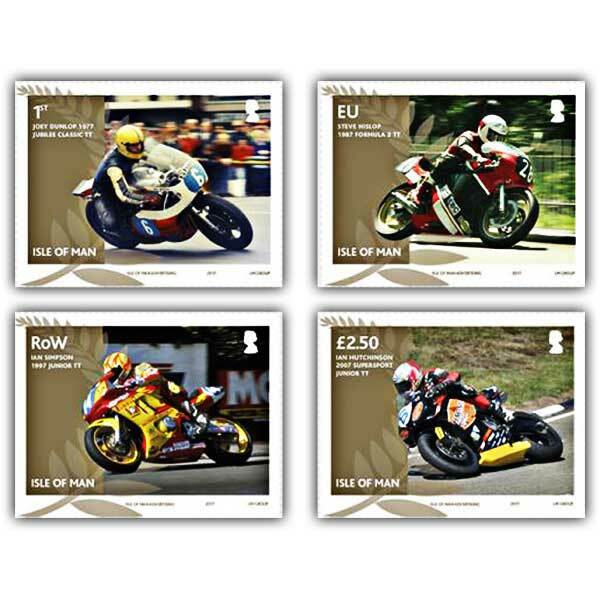 Joey Dunlop, Steve Hislop, Ian Simpson and Ian Hutchinson's very first Isle of Man TT wins are celebrated on this set of 4 stamps. 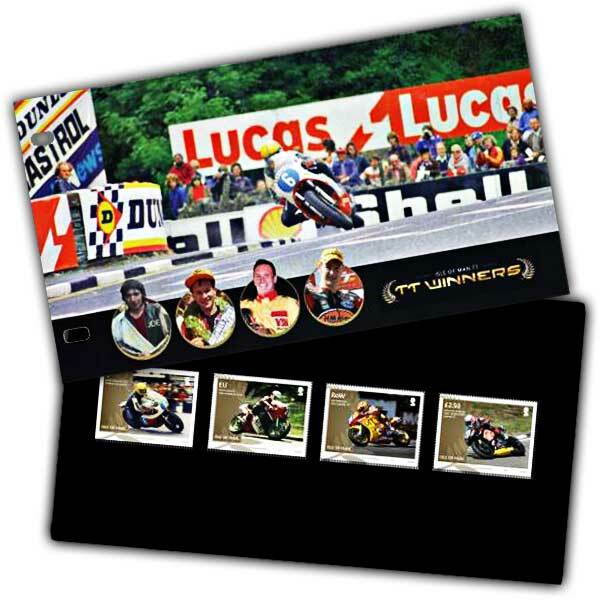 The shiny 4 page complete colour folder is packed with photographs of the racers making their mark on TT history. Renowned motorsport author and veteran TT marshal, David Wright offers thrilling text informing the story of the races which made these racers TT icons. The TT's most successful recent race, with 26 wins, Joey Dunlop took his very first win at the 1977 Jubilee Classic TT in spite of an engine misfire and needing to stop to examine the state of his rear tyre. Steve Hislop raced to his very first win a years after Dunlop, winning the 1987 Formula 2 TT, conquering stiff opposition and ignition issues along with what would be the very first of 11 TT wins. Following in his father's TT winning ways, Ian Simpson secured his very first victory in the 1997 Junior race. Fan favourite Ian Hutchinson, took his first win in the TT's centenary year, when he was victorious in the Supersport race. A decade later Hutchinson has 14 TT wins to his name! An ideal collectable for the motorsport fan in your life. Another fantastic addition to the ever growing collection. Always of the highest quality and the speed of ordering, processing and delivery is exceptional. Roll on the next edition being released.